Ajax youth academy product Wesley Sneijder signed for a record fee of 27M€ for the Spanish champions a 5-year contract in August 2007. After two seasons he moved to Inter Milan for a 15M€ fee on a 5-year contract. He made an immediate impact helping the club winning the league title. Sneijder extended his contract with five seasons in October 2010 until 2015. Sneijder was also part of the Dutch Worldcup 2010 squad who made it to the finals. He was one of the top scorers of the tournament with five goals. After refusing to extend his in 2015 expiring contract with lower wages, he was not playing anymore in the 2012-13 season. In mid-season there were rumours about a new future club for the Dutch international midfielder. In January 2013 Turkish giants Galatasaray announced the signing of Sneijder for a fee around the 10M€. The midfielder signed a 3,5 year contract until June 2016 in Istanbul. In October 2015, he extended with another two years his contract until 2018. In August 2017 Sneijder was released by his Turkish club. He moved to France to join Olympique Nice for the 2017-18 season. 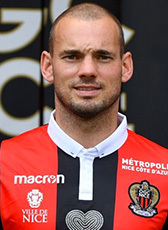 The first half of the French season was not so successful for Sneijder and he found a new opportunity in January 2018 moving to Qatar.